While Breakshot appears to be a simple game resembling a classic EM at first glance, this one level playfield is really feature packed. 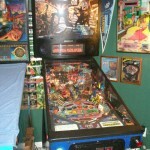 Designed by Greg Kmiec who created all time classics such as Paragon and Captain Fastastic, Breakshot can be considered a modern day EM with a DMD, multiball, drop targets, multipliers, stacking modes, full opening and closing orbit shot (Super Cue) and a ball locking mechanism in the middle of the playfield that is innovative and fun. Breakshot has 3 modes of 8-Ball, 9-Ball and Rotation with a wizard mode at the end. The wizard mode (with a great sound and light show), called Cutthroat Countdown, is where this game excels. The trick to high scoring is stacking the Breakshot Frenzy 3-ball multiball with the Cutthroat Countdown for 3X scoring. Loose a ball and it drops to 2X scoring. Trying to hit all 15 rotating flashing targets one at a time and in a row to get a big bonus at the end is very hard and the best part of the game. There is a trick to getting to the Cutthroat Countdown without going through the first 3 modes. Hit the undocumented skill shot multiple times. This is done by getting the ball up and over the shooter lane (like WH20), and hitting the Bank Shot with the little flipper. Really cool and really difficult. Other added features not found in WMS/Bally games: Adjustable flipper power with separate settings for the bottom two and the top right flipper. Adjustable solenoid power. Speaker in the back box have their own enclosures. The speakers themselves are much better sounding and the bottom cabinet even has an 8″ sub woofer. Audio sampling is very good. You can turn off the simulated scoring chimes (the game has simulated EM scoring reels in the DMD) if you desire. Somethings not so good: translite is poor quality and usually faded. One florescent light in the back box like modern day Sterns doesn’t look as classic as a populated light board. Other notes: drop targets can be bought at Marco or Pinball, Inc., Sega flipper pawl linkages can be used. Games usually hover around $1000 and the cab and pf are in excellent condition. Mine had a full mylar that I removed for a near new appearance.